Nizhny Novgorod Region has launched a joint project with Belgium worth $2 billion. Next in line is a contract with China, as well as active cooperation with Latin America and the United Arab Emirates. 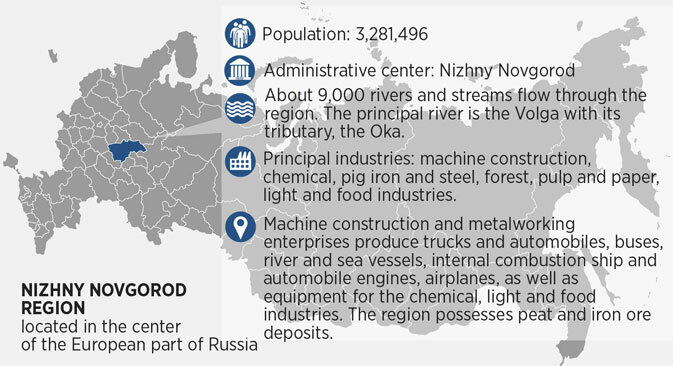 Yuri Groshev, Minister of Investment Policy for Nizhny Novgorod Region, told RBTH about the areas of business that the region plans to develop with these countries. The main areas of investment for the region are petrochemicals, automotive components and engineering, and machine building. For several years straight, foreign investment in our region has remained at the level of $1.2 billion a year. We also collaborate with European and Asian countries. September 18 saw the start of a $2 billion project with Belgium. It’s a joint venture between Sibur, a major Russian petrochemicals firm, and Belgium’s Solvay in the production of PVC (polyvinyl chloride). Another important line of activity we’ve just begun is to develop partner relations with Latin American and Arab countries. For example, we are now in talks with Mexico regarding the potential localization of production of automotive components. They have extensive experience in this field. Many of the world’s vehicles are assembled in Mexico. We recently met with Mexico’s ambassador to Russia and identified mutual interests that we will pursue. Arab countries are just beginning to enter the Russian market. For them, food security and agricultural production are top of the agenda, and consultation and collaboration have only just got underway. It should be noted that some Nizhny Novgorod investors are already doing business in the Arab world. One of our companies operates in Dubai. Another important and potentially long-term partner for us is China. This year we plan to sign an agreement on our first joint project with the Chinese to set up a railroad car repair plant. The first-stage investments will be around $600 million. Our region is very actively engaged in dialogue with Chinese delegations, and the prospects look good across a range of areas. One of the region’s tools for attracting foreign investors is the annual business summit in Nizhny Novgorod. This year’s summit was devoted to investments in infrastructure. We are interested in some major projects, one of which is the Moscow-Kazan high-speed rail link, which will pass through the region.